Of all the many, many reasons we have an epic, undying love for nachos, perhaps most importantly of all, nachos bring people together. They are the quintessential sharing food, as it is difficult and often inadvisable to eat nachos alone. Nacho reviewing is the perfect activity to engage in with old friends, new friends, or with one with whom one wishes to become more than friends. It is especially good to engage in with parents, as it can provide needed conversational respite from all those pesky questions about your “future” and and “job prospects”, in addition to making you seem like you’ve done something with your life since you at least have your own URL. Yes, a nachos were definitely in the cards when 2/5 of our parents (you do the math) rolled into town for Christmas. But no ordinary nachopatrol would do: these people are card-carrying members of the extra-virgin-olive-oil, baby-arugula-and-heirloom-tomato, artisanal-goat-cheese-drizzled-with-balsamic-reduction club. There is no way they would be cool slumming it at the Pour House, no matter how cheesy the nachos. So, we set out to find some upper-crust, high-fallutin’ nachos to share! Quality of Ingredients: (8 ) The chips, the same ones brought out in a complimentary basket with salsa, were just OK…it was hard to tell if they were house made or not. The beef, on the other hand, was delicious, in little chunks of tender steak. Black beans and pico de gallo added nice little pops of flavor. The jalapenos were actually edible for us gringos, and added a nice spicy flavor. Distribution of Toppings: (6) The cheese could definitely have been melted more, which would have added a little extra glue to keep the toppings on the chips. Overall, because they didn’t have chili, these were a rather dry nacho, but the flavor of the ingredients more than made up for it. There was no layering, but these were rather flat, and we could use the naked chips underneath to scoop up the extra toppings. Price: (9) At only $8.50 (with steak! 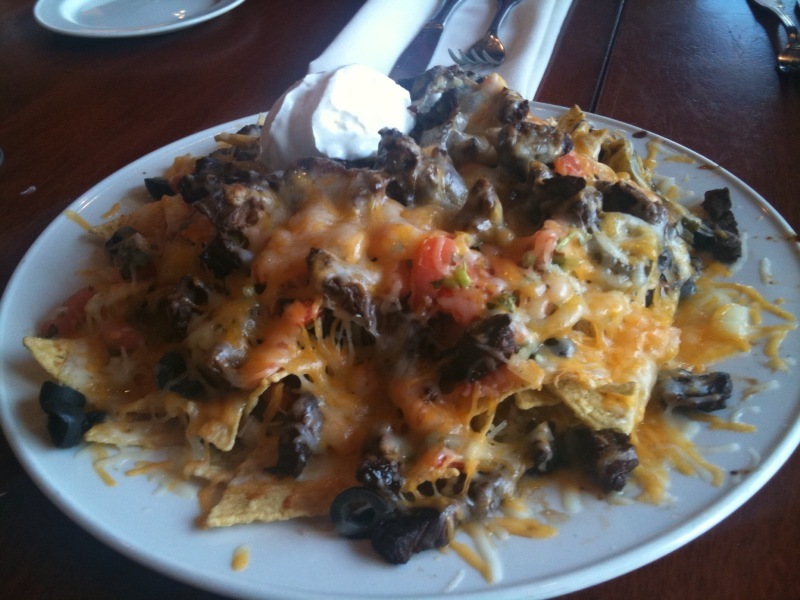 ), these nachos are a steal, especially for this restaurant. Not too huge, but they make up for it in taste. Overall: 31. A pretty darn good nacho, but not as delicious or exciting as many of the other items on the menu. Still, mission accomplished, parents impressed! Tags: Brighton, Christmas, Comm Ave, Guacamole, Sangria, Viva Mexico! ← Merry Christmas from Nacho Patrol!